The nice people at Westminster eForum invited me along to give one of the talks at their Digital Payments event at the Royal Society in London. I gave a talk about key trends in digital payments for 2016 and since I got some very nice feedback on it, I thought I would put a few of the key points on Tomorrow’s Transactions. 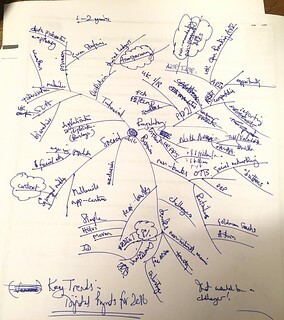 I don’t normally show behind the curtain, but here’s the mind map I drew for the talk. It’s a bit scruffy because I meant to do it on the train on the way up but there was nowhere to sit so I couldn’t do it until I got to the event and then I only had ten minutes to get it together. And yes, I know I put Atom Bank in the wrong place. And the figure of 8% should have been 7%, but you get the general drift of it. As you can see, I chose four themes to talk about: regulatory, business, social and technical. Here’s (roughly) what I said. On the technology road map I don’t think there’s terribly much uncertainty over any reasonable planning horizon anyone is involved in. Mobile is going to remain the central and dominant technology trend. We are shifting to mobile centric interaction for all aspects of finance and it’s hardly a controversial statement to say, well that looks like it’s going to continue so we won’t talk about that terribly much any more. We are mindful of the ECB strong consumer authentication (SCA) effort and that’s going to be a big thing for the coming year and obviously that’s started to verge into biometrics. Apple made the breakthrough of establishing biometrics in the mass market as a convenience technology rather than security technology, that’s been tremendously successful, and it’s going to continue. So I expect we will see a jump in mass market consumer biometrics. If you want to look out of the corner of your eye (William Gibson style) for the new technology that’s unevenly distributed, if you’re looking to start off your skunk works for next year, you could do worse than look at blockchain technology. I hate to bring up the dreaded word, I know everyone is sick of hearing about it, but… Consult Hyperion is a small company (there’s only 50 of us) and so hardly a statistical cross section of IT spending in the world economy, however the nature of the work that we do we means are a useful barometer for clients and I’m surprised by the amount of blockchain consulting work we have already. I think that is an indication that there’s a lot going on under the surface. The sector is developing more quickly than many people think, so if you want one new thing to play with: blockchain (or as I insist on calling it on Twitter, the replicated distributed shared ledger formally known as blockchain) is a very interesting area. When it comes to business, I think we can see some key trends around this space, but obviously they are a little fuzzier than the technology road map. If you focus on banking (which is where digital payments are located now) and look at the breakdown of European bank income you see pressure in all areas (except one). For European banks non-interest income is less than half of their income. 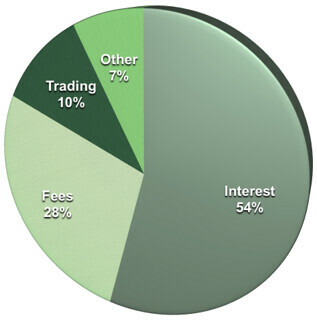 Net interest income more than half, but that’s obviously under pressure because of low interest rates, it’s also contains the profit pools there that are most at risk from the new players in that space (P2P lenders and people like that). Of the non-interest income, trading income is under pressure because the banks are being forced to reduce those activities, transaction fee incomes under pressure and in the digital payments space are asymptotic to zero. European Bank Income (Source: Deutsche Bank 2015). The one tiny little bit of that pie chart that I’m going to come back to a bit later on is that “other” segment, which currently accounts for only 7% of European bank income, but that’s the segment that our clients have to grow I think. They have to find new products and services and later on I’ll make a suggestion as to what I think one category of new product and service might be. So that’s banks, but there are other categories of organisation. There are the challenger banks, for example. I’m somewhat negative about the challengers. Remember I’m looking at this from a technological perspective and the challenger banks have by and large bought the same core systems as the incumbents and are offering essentially the same service It’s hardly surprised as they’re heavily regulated and there’s not much you can do with those services, so if you’re using the same systems and delivering the same services, essentially you’re the same. To my mind a genuine challenger would be something more along the lines of Fidor (which has a UK licence now) which is “amazonised” (API-centric) and has been from the start. There are two other categories that I’ve chosen to label non-banks and near-banks. Near-banks are things that look like banks to consumers but aren’t actually banks. When I’m working out of our US office I use a Simple account (now owned by BBVA which actually is a bank) but Simple wasn’t a bank, Simple was a prepaid card and an app, but to me the consumer it looked like a bank and it was more than adequate for my purposes. Near-banks that take specific niches in the marketplace and look like banks to consumers within those niches seem to me to be growing (you’ve got Holvi and Moven and people like that in that space) and, as an aside, being given a boost because of the renewed emphasis on financial inclusion. And then you have the non-banks. People tend to focus on what they call the OTT players, the Facebooks, Google, Amazon in that space and what they are going to do. There are plenty of rumours of who has and hasn’t got a payments licence, but I think one underplayed angle is that of the retailers. Retailers haven’t really moved in that space yet, but because retailers dominate the contacts with the customer, what retailers choose to do in that space, if they had any strategy toward it, might turn out to be more significant actually in many ways than what other people do. On the social side we have, for the sake of simplicity, a couple of groups to look at and respond to with new kinds of payment systems. The millennials are happy with Venmo and so on. But what about the rest of us? First and most importantly, I think, for many people is the ageing population. We recently examined a scheme using mobile phones to log into bank accounts via a face recognition system. It proved to be rather popular and not, as you might have thought, with toy-obsessed millennials, but actually it was older people who can never remember passwords or PINs or anything like that, and the idea of just looking at the phone was much more popular in that demographic than the young! We tend to think about the technology stuff as to do with millennials, but actually there’s a fantastic opportunity to use the new technology to serve other groups. At Consult Hyperion we’ve been involved in a fair few projects using mobile (and digital television) to deliver financial services to excluded groups and I think these will grow and develop in the short term. Then you’ve got the squeezed middle, so that’s people like me who have to catch the 7.52 from Woking in the morning and barely make it alive into Waterloo, scrabbling to keep up with things, sliding further and further into poverty as we are taxed to the hilt. We are are very time poor and so we need services that are delivered on the spot and with context and you will see that word “context” appearing more and more frequently in the services and products that you see coming to the market in 2016. So a lot of the stuff that’s in R&D at the moment that’s a little bit underdeveloped is about context and delivering better services in the right context, as my good friend Brett King has long predicted. And finally there are the regulatory trends. Our clients tend to be at the larger end of the scale, so for our clients these are by far the most important trends. It doesn’t matter if people come up with a super duper clever blockchain, it doesn’t matter if they come up with a niche to sell it to millennials, it doesn’t matter if they come up with a terrific near-bank structure to make it all work, because actually this is a regulated world and regulatory trends set the envelope that we can work within, and I just want to point out two key regulatory trends which I know are going to be covered in a lot more detail later on. The first one is the trend to what people have started to call instant payments. FPS, the faster payment service, is well established in the UK. Regulators made the banks implement an instant payment service, and that instant payment service has been fantastically successful and it’s enabled things on top of it already, like Pingit and Paym and so on, and there’s more to come in that space. Other countries have started to go down that route, there are many other countries that already have instant payments in place. The one great exception was always the US because the Federal Reserve has no regulatory power to make banks implement an instant payment system, so we all thought it would be some time before instant payments appeared in the US. That gave a space for people like Venmo and so on to play in, but actually in the last couple of months we’ve seen a raft of announcements coming out of the US. There is The Clearing House with VocaLink, as a prime example. So even in the US you seek this shift to instant payments. You might call it RegTech rather than FinTech! The technology hasn’t changed, but the regulatory space has opened up for instant payments and there’s going to be a raft of start-ups taking advantage of that. The second is PSD2. You can’t get away from it. For most of the people we work with, PSD2 in general and the open API space in particular are a great focus of attention at the moment and this is where the opportunity to grow the “other” segment comes from. PSD mandates that banks have to provide open APIs to third parties by 2018. The EBA has set out three categories of those APIs. These are the mandatory payment APIs which all banks will have to implement so that regulated third parties can have direct access for account information and for transaction initiation, the non-mandatory payment APIs which banks will be allowed to offer so that they can provide some unique special services and the non-mandatory non-payment APIs. I think that that “other” segment in digital payments maps to these non-mandatory, non-payment APIs, so if you want to look for an opportunity to make something really interesting, really different, really special in digital payments in Europe in 2016 then you should be looking at not the digital payment services but the services that go around them, the valued-added stuff that goes around payments that banks could deliver. A non-mandatory, non-payment API to create a new business? How about identity which, as we all know, is the new money. So: in summary the technical, business, social and regulatory changes around digital payments are coming together to make it an interesting year and there is plenty of opportunity for new entrants as well as incumbents to exploit these changes to take the digital payments sector forward in a real win-win-win (for consumers, service providers and regulators). So very well said David. Very interesting look behind the curtain David, but your prediction that Gwen Stefani will lead in Technology is way off…. her hearts always been in Regulatory.